Industrial Fertilizer Mixers By A&J Mixing - Call Today For A Quote! Our industrial fertilizer mixers handle product that is corrosive and production is seasonal. For these reasons parts in contact with the product and operation parts that can rust that will inhibit operation, are of Tp304 Stainless Steel. 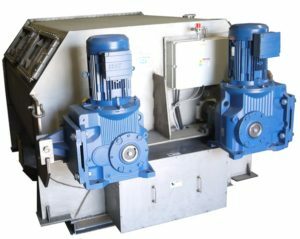 Our high performance industrial fertilizer mixers (HPM) are a line of double rotor mixers customized specifically for the fertilizer industry. Use our Double rotors for fast mixing and cycle times (typically one minute), and in these larger sizes, they are better for end to end transportation of minors, adding liquid, and hopper design. Side brackets support the mixer and the hoppers hang from the mixer. Hoppers over 5000 lb. (2400 kg) required extra support. There is no dynamic load. Machines will have extra height and ability to add pipes for adding liquid. We can supply liquid systems. All Sealed bearings –do not grease. Rotor seals are a packing gland, spring loaded with stainless spring washers to prevent leaks from starting. Seals always fail while in production, so being able to do a quick fix without having to take the machine apart, is a big advantage. They can groove the shaft which is repairable or prevented with a sleeve. Hardened shaft sleeves are available. Typically, 30 seconds to 1/2% standard deviation and Cv of 5%. One minute is the cycle time – 15 seconds fill, 30 seconds mix and spray, 15 seconds to discharge. The housing sides and ends, rotors, discharge door, discharge door shafts and internal linkage are all stainless steel. Stainless will be as rolled finish, no welds ground nor discoloration removed. Side doors will be bolt-on with the option of hinged and clamped with safety switch. Rotor seals are packing gland, spring loaded with stainless spring washers to prevent leaks from starting. Discharge is air operated drop bottom with limit switches for door position. Air cylinders hold the door tightly in position to prevent leaking. There are 22 specific parameters used for door and seat design so they work properly. Gaskets are mechanically held in place. Typical seal life is 3 years.